If you ask most people, “What is Advent?” they will probably not be able to give a correct answer. At best, they might tell you that when they were children they opened the doors of an Advent Calendar in the days leading up to Christmas. Similarly, if you asked the average person in the street, “What are the Twelve Days of Christmas?” they might only be able to sing a few lines from the song of the same name. 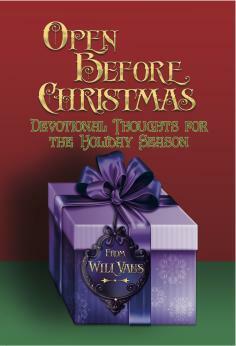 Both informing and inspiring, Will Vaus’ book, Open Before Christmas, reflects the wonder of this “most wonderful time of the year” and provides a feast of biblical meditation for the whole season. Starting with the weeks of Advent preceding Christmas Day and travelling through the “Twelve Days of Christmas” to Epiphany, Will leads our hearts and minds through the story of our Lord’s Incarnation with daily readings, seasoned with inspiring, touching, and sometimes humorous illustrations. His introduction is a helpful summary of the origins of the Christmas calendar and of certain Christmas customs, which everyone needs to know. I found his writing immediately engaging and, the more I read the book, the more I liked it. God has touched my heart by reading Open Before Christmas, and I believe he will touch your heart as well.